I came across this new exciting tool for perceived safety in cities. Among New York, Boston, and Chicago was also Detroit. I was almost too excited that Detroit was being geographically studied alongside those other cities until I read into the project further. “Place Pulse aims to quantitatively recognize which areas of a city are perceived as wealthy, modern, safe, lively, active, unique, central, adaptable or family friendly. With enough user participation, Place Pulse can identify which neighborhoods in Bangkok are perceived better than neighborhoods in New York City or to examine how the distribution of a certain perception in Mexico City compares with that same perception in Tokyo. Place Pulse creates its output via an algorithm called StreetScore that depended on at least 7-10 clicks per city image, of which there are about 100,000 for 54 different cities (not including Detroit). 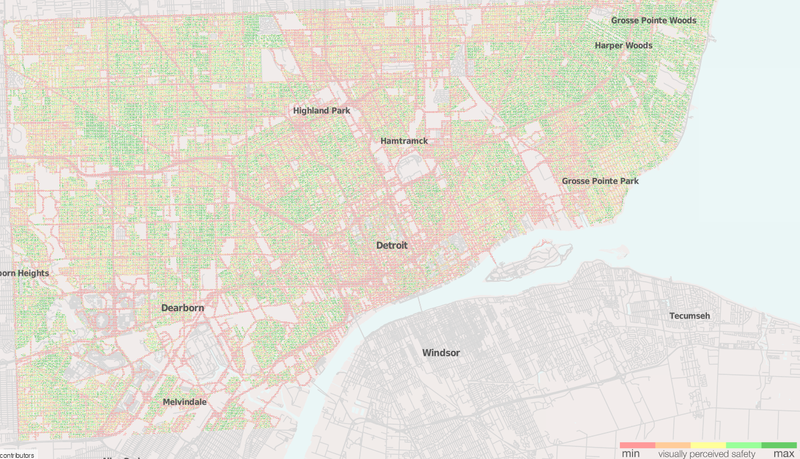 The StreetScore algorithm was then applied to Detroit based on characteristics found in other cities. However, I’m not sure how well it matches with Detroit. Streetscore assigned this vacant house on the Eastside with a high score although the area is not the most well maintained. I can only assume that the algorithm saw a lot of greenery in the image and thought it was a park or green space. I clicked on a number of highly scored vacant lots and abandoned houses, which I would have given very low scores. The flip side was also true. Locations where I have driven and walked show up with low scores. This particular example is St. John’s Church with grass mown, cars always out front, and an obviously well cared for building. This church is located in not the best area, but this particular image would make me feel more safe than an abandoned building. I think the StreetScore is an interesting idea, but it is too difficult to quantify perceptions, which are inherently qualitative and likely vary for people across cities, countries, and continents.